This snap frame has a 22" x 56" poster holder. 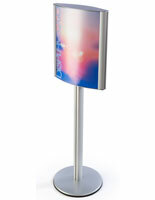 Snap Frame: Banner Pole Vertical Display Stand 22"x 56"
Take your indoor presentation to a new level with this FORTE aluminum snap frame. 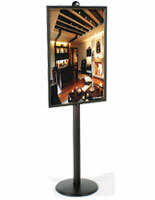 FORTE snap frame displays are a classy way to showcase your indoor billboard, or banner systems. 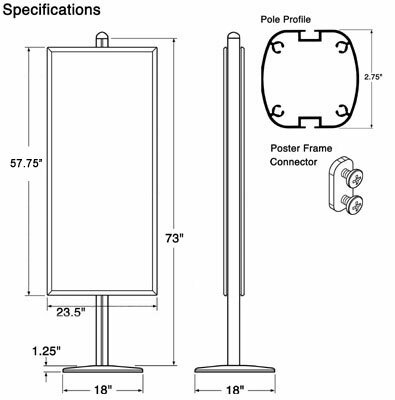 This tall snap frame display has a single long vertical quick close frame with an approximate viewing area of 21" x 55" (leaving ½" around for the frame edges.) 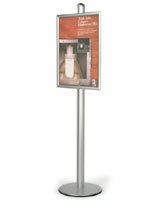 An 8ft tall aluminum pole with an adjustable track tops the sturdy base. Your graphics are covered by a non-glare lenses for easy viewing. The snap frame adjusts within the track to the perfect height for your display. No indoor billboard, stand, banner system, or other snap frame offers the simplicity and variety that this indoor presentation offers. The adjustable track lets you position your snap frame display with ease; simply adjust to the desired height and tighten. 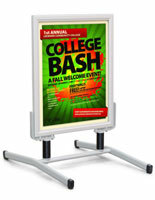 This snap frame accentuates your poster or banner with an eye-catching indoor presentation. Perfect for all types of retail displays, this snap frame, better known as an indoor billboard, is the perfect focus for your sales. 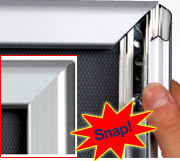 Change your display as often as you'd like with the front-loading snap frame. There is no need for your indoor presentation to stand alone; buy these snap frame billboards in multiples for a striking retail display. 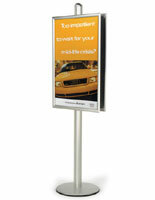 Banner systems like this snap frame take up little space on your sales floor but offers a big advertising punch. 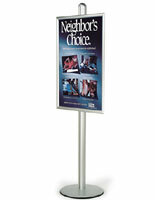 Purchase a snap frame for your next retail display.